I came back to Istanbul this week, after spending three weeks at home in the UK. On my return I was greeted by airport newsstands full of papers with headlines focusing on the funerals of the nine “martyrs” killed in the recent terror attacks in the southern Turkish city of Gaziantep. Of course, I kept vaguely up-to-date with events while I was away, but the contrast between Turkey – currently in one of those periodic bouts of nationalist hysteria that always follow clashes with the Kurdistan Workers’ Party (PKK) – and Britain – which is still basking in the fuzzy, generous, inclusive afterglow of the London Olympics – was nevertheless striking. Although there are serious doubts as to whether the PKK was actually responsible for this latest attack, the Turkish press did not hesitate in reverting to predictable form. For a flavour of the current mood, here is a selection of newspaper front pages from Thursday (Aug. 23), focusing on the previous day’s funerals. Islamist daily Yeni Şafak’s main photo also showed the same funeral. The headline above read: “70 million people on the same side”. Finally, here is the reassuring front page of tabloid daily Güneş’s Friday edition. The headline referred to counter operations conducted against the PKK by the Turkish military in the southeastern province of Hakkari: “30 Traitors Killed”. Since the establishment of the Republic of Turkey in 1923, received wisdom has tended to consider nationalism and Islam as mutually incompatible forces in the Turkish context. Turkish nationalism – so this narrative goes – is defined by the secularizing, modernizing example of Mustafa Kemal Atatürk, a positivist, military man with an almost religious faith in the ability of science to reshape society. Islam, with its appeals to multinational, multiracial unity, inevitably stood in the way of the “pure”, homogenous nation-state. Such an understanding was propagated by those early secularizing elites within Turkey itself, and largely accepted by observers outside the country for the better part of the past hundred years. However, the fact is that religion has always been a crucial motivating force behind popular expressions of nationalism in Turkey. What makes the current Justice and Development Party (AKP) government’s position unique is its wedding of a popular religious nationalism to real political power. Recent developments – in particular the ongoing recent spat between Turkey and Israel – demonstrate to outsiders what has been observable within Turkey for a long time: that Islam and Turkish nationalism are far from irreconcilable on the political, as well as social, level. A singular irony of the founding of the Turkish republic is the fact that for all the talk of institutional secularism, the new nation was, in fact, fundamentally defined on religious grounds. Significant numbers of those resettled on Turkish land during the Greek-Turkish population exchanges, for example, were Greek-speaking Muslims, who, in many cases, could not even speak the Turkish language. The Kurds (and other non-Turkish Muslim minorities) were also included on religious – rather than linguistic – grounds. Whether you spoke a dialect of Laz, Kurdish, Zazaki, or Turkish, religion was the most important category to fulfill in order to be included in the new Turkish state. Even Atatürk himself recognized the increased importance of religious sentiment, and was not averse – particularly in the early years of his leadership – to appealing to the emotional religious feelings of the people when seeking to unite the nation behind his resistance forces. He led the War of Independence as a Gazi, (meaning “Warrior of the Faith” in it’s original Arabic form), repeatedly invoked the name of God and the spiritual dimension of the liberation struggle in public pronouncements, and established Sunni Islam as the state religion in 1924. Such an approach was seen as necessary following the religious retrenchment experienced by the Ottoman Empire during the late -19th and early -20th century. The loss of almost all Ottoman territory in the Balkans prior to the First World War resulted in the flight of around 400,000 Muslim migrants from hostile regions, to re-settle in Istanbul and Anatolia. Similarly, around the same number of Circassian Muslims from the north coast of the Black Sea also migrated to Ottoman territories in the 1860s, escaping from the increasingly aggressive practices of the Russian Empire. These migrants, or muhajir, had learnt to wear their religion as the singular mark of identity, and saw in the Ottoman Empire (and subsequently the Turkish Republic) a protective confessional motherland. Anatolia went through enormous demographic changes during the later years of the Ottoman Empire. Erik J. Zürcher estimates that immediately prior to the First World War, Anatolia was 80 percent Muslim, whilst ten years later, this figure had risen to 98 percent. This more narrowly Muslim composition inevitably had a large impact on the policies and attitudes of the late-Ottoman and early republican eras. The decision to empty Anatolia of Christian Greeks, Armenians, and Syriacs – both before and after the establishment of the Republic – clearly illustrates how the new nation’s identity had become inseparable from its Muslim identity. This religious definition was emphasized even as Turkey’s new elites were preparing to systematically cleanse Islam from state institutions. The newly independent Turkish republic was not just neutral to religion; it actively subordinated it to the state, establishing a rigid and doctrinaire form of laicite in a country that until recently had been the seat of the Islamic Caliphate. All expression of Islam was to be tightly regulated by the new Diyanet İşleri Başkanlığı (Department of Religious Affairs) to ensure compliance with the new secular order. The Caliphate was abolished; independent religious establishments were closed down; imams were appointed and their Friday sermons were written by the state; women were discouraged from wearing the veil. Myriad other cultural and political reforms were initiated, aiming at faster and more effective Westernization. All of this was imposed from above, and all was done in the name of modernization, secularization and – crucially – nationalism: to oppose the changes or the way they were implemented was to risk vilification as an irtıcacı (reactionary), against the modern, independent Turkish nation. The military became the symbol of the secular order, and the four (if we include the “post-modern” coup of 1997) coup d’états that the country experienced during the 20th century were all – at least in part – military responses to perceived religious incursions into political and social life. Thus, it is clear that there was a tension – even predating the declaration of the Republic – between the technocratic, secular nationalism of the reforming elites and the religious character that was essentially the defining feature of the new nation. In his fine assessment of modern Turkish history, Perry Anderson has described Kemalism as an “ideological code in two registers. One was secular and applied to the elite. The other was crypto-religious and accessible to the masses. Common to both was the integrity of the nation, as supreme political value.” Atatürk’s secularizing reforms have too often been accepted as the defining features of Turkish nationalism but it is clear that such dry, technocratic reforms could not possibly constitute the sole emotional appeal influencing such an aggressive and deeply-felt nationalism. It is significant, for example, that the extreme nationalists of the far-right Nationalist Movement Party (MHP) – which won 13 percent of the votes in the parliamentary election of June 2011 – responded to the reopening of the historic Armenian Surp Haç Church in Ani with reactiveFriday prayers, which they organized two weeks later in the same location. Likewise, it is striking that Turkish soldiers, felled in counter-insurgency conflict with the PKK, are uniformly referred to as şehitler, or “martyrs”, by the Turkish media. The spectacular electoral successes of the AKP, an Islamically-oriented party, starting in 2002, seemed to challenge the assumptions of the secular-nationalist paradigm even further. Here at last, it was thought, was a way out of the monocultural impasse, a tonic to divisive and destructive Turkish nationalism. Many optimistically hoped that the AKP would take the country to a post-nationalist state of peace, respect for human rights, and economic prosperity, and a series of symbolic ‘openings’ helped warm up relations with minority communities within the Turkish borders. In particular, the government was expected to attempt a solution to the “Kurdish Question” by re-emphasizing common religious bonds between Turks and Kurds. More progress was made in the European Union accession process by the AKP than any previous government. It also defanged the Turkish military – that bastion of unreconstructed secular nationalism – which it accuses of plotting a coup to overthrow the elected government in the Balyoz, or “Sledgehammer”, case. It is becoming clear, however, that the government’s struggle against the generals was in fact only a strike against one, narrowly defined, type of nationalism. Another has become evident, and this form can be said to constitute the new ideological bedrock of the AKP government. Campaigning during the parliamentary election of June 2011, Prime Minister Tayyip Erdoğan adopted a much harder note on the Kurdish question than ever before, and – the AKP having won almost 50 percent of the popular vote – he has continued this tendency since. In response to the Kurdistan Workers Party (PKK) attacks on Turkish forces stationed near the Iraqi border in October, the government retreated back into the full scale military solution that has failed to solve the problem thus far. The feeble “apology on behalf of the state” that Erdoğan offered in November for the Dersim Massacres of 1937-39 can be summarily disregarded, representing nothing more than the government’s latest attempt to score cheap political points against the opposition Republican People’s Party (CHP). The EU process is effectively dead, and the government has wasted no time laying the blame squarely at the door of the EU itself. The United States – and “the West” more generally – comes in for increasingly strident criticism, sanctioned by rising anti-American sentiments in Turkish society (a recent poll found that 64.8 percent of Turks have a “negative” opinion of Americans). Despite evident deficiencies in the “Turkish model”, Erdoğan obviously relishes being idolized across the Arab world and, emboldened by a booming economy, he flexes his muscles on the world stage as no Turkish leader has before. Appealing to the collective libido dominandi, such behavior wins him ever more support back home. Boorish populism is prosecuted in the name of greater and deeper democracy. The equation of Turkish with Muslim identity was always tacitly understood; now it is explicit. Whilst previous Turkish administrations have, at times, won support by appealing to both nationalist and religious sentiments as well, none have done so as successfully as the AKP. Erdoğan differs from Turgut Özal in degree, organization and success, having become the first leader in Turkish history to win three consecutive elections, with a consistently rising share of the vote. The AKP’s real innovation lies in its ability to achieve what no other government has before: wedding populist religious nationalism to the levers of government and remaining in power whilst doing so. As with all nationalist movements, the AKP’s needs outside foes against which to define itself, and perhaps the most significant of these today is Israel. The raid by the Israeli Defense Force (IDF) on the Turkish “Mavi Marmara” aid ship bound for Gaza in 2010 caused widespread public and political outrage, and the Turkish-Israeli diplomatic relationship has since deteriorated to such a degree that Turkey has almost entirely suspended political, military and economic ties with Israel. Owing to the widespread popular support for the government on this issue, the AKP has no motivation to desist; indeed one could argue that it may even have an interest in prolonging, even escalating the dispute. The spat brings into sharp focus the elision that has occurred between nationalism and religion: a hitherto unheard-of instance of secular nationalism and emotional religious indignation uniting in a common cause. Nationalism and religion have been the two primary energizing forces in Turkish society for almost a hundred years, even if one has always dictated to the other. The current Turkish government’s rhetoric manages to appeal to both impulses, and that is why it is such a powerful brew. Erik J. Zürcher, Turkey: A Modern History, (London: I.B. Tauris, 2004), p.164. Over two weeks in September, the 5th Beyoğlu Antiquarian Book Fair was held in Tepebaşı. Luckily I had returned to Istanbul a few days before it had finished, so was able to take a look for myself. There were so many stalls taking part that it was almost overwhelming, and I did get that familiar ‘book fair fatigue’ after a while. Finding a century-old Ottoman newspaper in a dusty second-hand bookshop is a thrill, but when they come in hundreds the impact is somewhat attenuated. I did make one fine discovery though, an attractively dog-eared collection of early Republican-era Turkish nationalist poems. 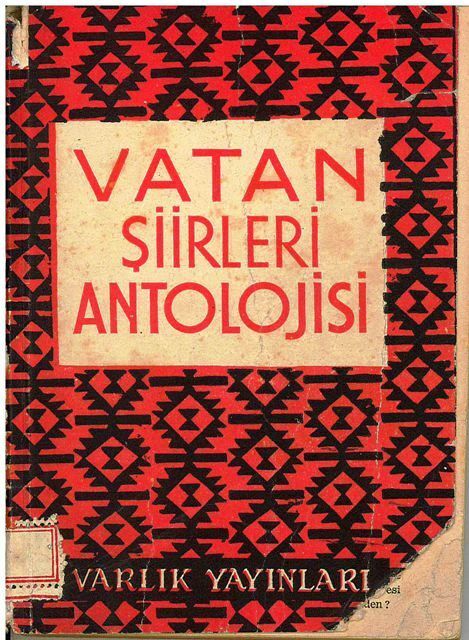 It was printed by the publishing arm of the legendary Turkish literary journal Varlık and, though undated, research suggests that it was probably published in the mid-1950s. free of unwieldy, punctuation-less sentences of multiple subordinate and qualifying clauses, and this makes it “easy” for the non-advanced Turkish speaker to translate at least their surface meaning. So, flicking through the book one night, I decided to have a go at some from this collection, my first deliberate experiments in translation. these poems contained. Aside from converting the Turkish language wholesale from the Arabic to the Latin script, a systematic attempt to banish words of “foreign” origin was effected during the early years of the Turkish republic. Over time hundreds of such words, (mostly Arabic and Persian), gradually fell out of use in the name of ‘purifying’ Turkish and making it ‘fit’ for the modern world. It’s ironic that many of the poems in this collection still use a great many of these old terms, despite clearly sharing the positivist, modernising impulse to forge a modern language, purge foreign influence and celebrate the ‘authentically Turkish’. Even Kemal Atatürk’s speeches are understood with some difficulty by modern Turks, so radically has the language changed since his time. Many words that I came across in these poems – such as “hirfet” (small tradesman/artisan) or “huda” (a folksy word for God) – are now largely unknown in Turkey, and can’t be found in modern dictionaries. I would sometimes ask Turkish friends if they knew the meanings of words that gave me particular trouble, and most of the time they didn’t. Nevertheless, I was certainly helped by more fundamental characteristics of the poems. Most are imbued with the straightforward, scientific, unfussy spirit of the early Republican era, so there were no tricksy literary devices to contend with. If there’s awkward phrasing, gauche poetic posturing, and inconsistency of tone, that may be down to the poems themselves rather than their neophyte translator(!) They’re far from classics but they do, I think, have some interest as historical artefacts. Peasants understand the meaning of their prayers. Oh Turkish son, your motherland is there! There are no other eyes for our soil. The path to art is shown by science. In your valleys I grew grass. They could find nothing to take. I wandered helpless on your streets. I wandered in my mind. On your desolate, barren plains. My clouds, my dear clouds, stop wandering. What is it, let’s go south together. In the south I have villages waiting for rain. My villagers open their hands to the sky. My wind, my north wind blow. We’re taking rain south, quick! In the south the vineyards, the gardens are roasted. Can you hear the sound of the ezan? My villagers left to pray on the hills. Ah we’ll be late this time. Here the burnt plains, here the thirsty villages. The crops are still white, the seeds have fainted. Don’t stop, don’t stop, don’t stop rain! You’re honest, my clouds, forgive me. I’ll open channels, your deep desires. From your earth I also ate. Your mind’s pain is the wildest fever. In cradles, temples, in every corner you mourn. To your self-sacrificing sons I offer one hundred thousand tributes. Since the establishment of the Turkish Republic in 1923, received wisdom has tended to view nationalism and religion as mutually incompatible in the Turkish context. Turkish nationalism, so the narrative goes, is defined by the secularising, modernising example of Mustafa Kemal Atatürk, a military man with an almost religious faith in the ability of science to reshape society. Islam, with its appeals to multinational, multiracial unity, inevitably stood in the way of the ‘pure’, homogenous nation state. Such an understanding was propagated by those early secularising elites within Turkey itself, and accepted by observers outside the country for the better part of 100 years. The current AKP government, however, is challenging this formula. Recent developments – in particular recent spat between Turkey and Israel – demonstrate that Turkish religion and Turkish nationalism are far from irreconcilable. A singular irony of the founding of the Turkish republic is the fact that initially the new nation was defined primarily on religious (rather than linguistic) grounds, (with, it must be said, an unhealthy dose of ethnic nationalism thrown in for good measure). Significant numbers of those resettled on Turkish land during the Greek-Turkish population exchanges, for example, were Greek speaking Muslims who in many cases couldn’t even speak the Turkish language. The most important fact was that they were Muslim: religion was the most important category to fulfil in order to be included in the new Turkish state. The irony is that this definition was emphasised even as Turkey’s new leaders were systematically attempting to ‘cleanse’ religion from public life. The newly independent Turkish republic wasn’t just neutral to religion, it was actively hostile, establishing a rigid and doctrinaire form of laicite in a country that until recently had been the seat of the Islamic Caliphate. The state would be actively superior to religion, and all expressions of Islam were to be tightly regulated by the “Diyanet İşleri Başkanlığı” (Department of Religious Affairs) to ensure compliance with the new secular order. The Caliphate was abolished; independent religious establishments were closed down; imams were appointed and their Friday sermons written by the new religious affairs department; women were discouraged from wearing the veil. Myriad other cultural and political reforms were initiated, aimed at faster and more effective Westernisation. All this was done in the name of modernisation, secularisation and – crucially – nationalism: to oppose the changes or the way they were implemented was to risk vilification as a ‘gerici’ (reactionary), against the modern, independent Turkish nation. The military became the symbol of the secular order, and the four coup d’etats that the country experienced during the twentieth century were all – to a greater or lesser degree – military responses to perceived religious incursions into political and social life. Inevitably, tensions also developed with minority communities who felt excluded from such a rigid understanding of the Turkish nation, and during the 1990s something like civil war exploded in the south-east of the country between Kurdish guerrillas and the Turkish state. The paradigm seemed to be broken with the spectacular electoral successes of the AKP, an Islamically-oriented party, starting in 2002. Here at last, it was thought, was a way out of the monocultural impasse, a tonic to divisive and destructive Turkish nationalism. The new government sounded a refreshingly emollient tone, and a series of symbolic ‘openings’ helped warm up relations with the Kurds, the Greeks, and the Armenians as well as other minority communities within the Turkish borders. In addition, more progress was made in the EU accession process by the AKP than any previous government. This rosy picture, however, has soured recently. Campaigning during the parliamentary election earlier this year, Prime Minister Tayyıp Erdoğan adopted a much harsher note on the Kurdish question than ever before, and – the AKP having won almost 50% of the popular vote – he has continued this tendency since. The EU process is effectively dead, and the government has wasted no time laying the blame squarely at the door of the EU itself. The USA comes in for increasingly stinging criticism (again sanctioned by rising anti-American sentiments in Turkish society). Emboldened by a booming economy, Erdoğan flexes his muscles on the world stage as no Turkish leader has before, which – appealing to the collective libido dominandi – wins him ever more support back home. Boorish populism is prosecuted in the name of greater and deeper democracy. As with all nationalisms, the new Turkish model needs outside foes against which to define itself, and perhaps the most significant of these today is Israel. The raid by the Israeli Defence Force on the Turkish aid ship bound for Gaza in 2010 caused widespread public and political outrage, and the Turkish-Israeli relationship has since deteriorated to such a degree that Turkey has almost entirely suspended political, military and economic ties with Israel. Owing to the widespread popular support for the government on this issue, the AKP has no motivation to desist; indeed one could argue that it may even have an interest in prolonging the dispute. The situation clearly illustrates how far popular Turkish nationalism has shifted: a hitherto unheard-of instance of secular nationalism and emotional religious indignation uniting in a common cause. Nationalism and religion have been the two primary energising forces in Turkish society for almost a hundred years, even if one has always dictated to the other. The current Turkish government’s rhetoric manages to appeal to both impulses, and that’s why it’s such a powerful brew.